Romania is currently redeeming its rich heritage following the collapse of an oppressive dictatorship. This charming country embodies the European spirit of past, present, and future. Picturesque castles and quaint farming villages contrast with cosmopolitan cities and ski resorts as the country strives to develop its economy after the fall of communism and its recent admission to the European Union. The Transylvania region in central Romania is home to many treasures, among them the idyllic town of Brasov, where our program is located. This quaint town is only 160 kilometers from the capital of Bucharest and exemplifies the fairy-tale medieval architecture and cobblestone streets of a traditional Eastern European town. 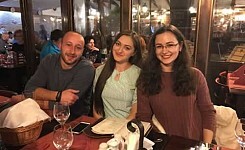 Volunteer work will be centered in the city of Brasov at one of two center locations, but there will be ample time to explore the town center as well as the countryside if you so desire. Globe Aware works closely with a local grassroots organization assisting children and adults with special needs such as Downs Syndrome, Asperger’s, an don the Autism spectrum. Unfortunately for these children, regardless of their condition, the Romanian state does not have a public oriented towards recovering and integrating the children into mainstream education, developing their potential and preparing them for an inclusive labor market. Due to this approach, the majority reach adulthood as socially-assisted individuals. Currently the center offers a variety of services that are not readily available to them otherwise. 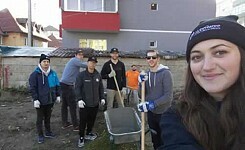 The projects revolve around refurbishments, maintenance and improvements to two day therapy centers within the city of Brasov, in addition to a variety of “soft touch” interactive volunteer opportunities with our recipient community. The centers offer a variety of services to those in need including specialized forms of therapy, support groups for parents, provide information from specialists aboard - translated and distributed for free, and conduct assessments by qualified therapists. 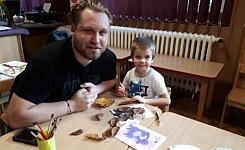 In addition, since people with autism spectrum disorders are usually isolated in Romania, lacking opportunities for leisure and socializing, their association offers a combination of specific therapeutic programs and an educational program focused on developing life skills, which increases the capacity of their beneficiaries for learning and bonding, while reducing the severity and frequency of unwanted behaviors. 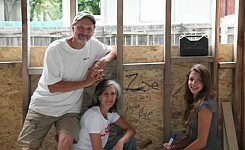 Staff and volunteers organize fun and entertainment activities for their beneficiaries, activities that take place in the Day Center, and in the real world, outside therapy hours, focusing on strengthening the skills acquired through excursions, trips at the equestrian center, at city playgrounds, to the zoo, bike rides, etc. 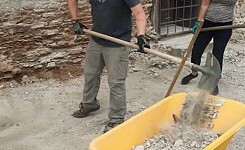 In addition to these types of soft touch volunteering projects we also may work on the upkeep and maintenance projects that the volunteers may work on at the centers. 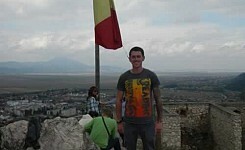 Globe Aware volunteer vacations to Romania - SIGNUP NOW! Volunteers are accommodated two to a room in one of the architectural Art Nouveau jewels of Brasov, built in 1910. It is a modest hotel, but is conveniently located on the most famous pedestrian street in Brasov, just a few minutes’ walk from the Black Church. Rooms are basic with central heating, running hot water, 24-hour reception, and Wi-Fi. Breakfast takes place every morning at your hotel, while lunch will be at the therapy center on most days. Unlike most of our programs, dinners will be taken independently, given the huge number of enticing, delicious and affordable restaurants within walking distance to your accommodations. Your coordinator can also give you recommendations, though we know you will not have any difficulty in spotting them. Typical Romanian food includes mamaliga, a cornmeal dish that may be boiled, fried, or baked; different varieties of soups and many meat and vegetable dishes. Wine is also a staple beverage, and regional varieties are plentiful. 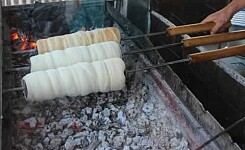 There are many cafes and stores in Brasov where you may purchase additional snacks, coffee, etc. 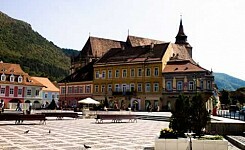 Free time may be used to explore Brasov's historic town center. Sights include two watchtowers, which protected the walled medieval center, the History Museum right in the heart of the Townhall Square, the Romanian Art Museum, and the famous Black Church. A cable car carries visitors to a stunning view of the Brasov center from atop a small plateau. There are a number of medieval fortresses and churches in the surrounding area. The most famous of these is Bran Castle (more commonly known as Dracula's castle), only 30 kilometers south of Brasov, as well as Rasnov, a quaint citadel. In the vicinities of Brasov you'll also find the Royal Summer Residence - Peles Castle - in Sinaia, an enchanting small mountain settlement and ski resort. Also, depending on the length of your stay and on your preferences, you can experience a bath in the thermal waters near Brasov, trekking in the forest/mountains, or a Romanian ball. Volunteers should be at the meetup point in Brasov at 4:30 pm on the Saturday the program begins. While you are responsible for getting yourself to the city of Brasov, we are happy to help arrange private transportation if desired. From the airport in Bucharest, it is around a 2.5 to 3-hour drive to Brasov and will cost $100 USD each way. There are plenty of other transportation options to consider as well, though volunteers will be responsible for arranging this independently. A shared taxi from the airport to the hotel in Brasov will cost around $30 USD. There is also the option of taking the train, which takes around 3 hours and costs anywhere from $8-$20 USD depending on the schedule and cabin class. Volunteers are free to depart after breakfast on the last day of the program. Ask us for more details on these options. As there is so much to see and do in Transylvania, we encourage you to take some time and explore the region. Call our office for recommendations for onward travel. Romania is politically stable and suffers from petty street crime similar to other major cities. Using common sense and not carrying large sums of money, passports, and bank cards in an easily accessible area should help deter thieves.